Imagine a shark passing you, with its open jaws, while you are diving in the dark depths of the sea. It is in your worst nightmare you will be caught up in such a horrifying situation. Well, in reality swim with the sharks has emerged to be one of the most popular tourism attractions. 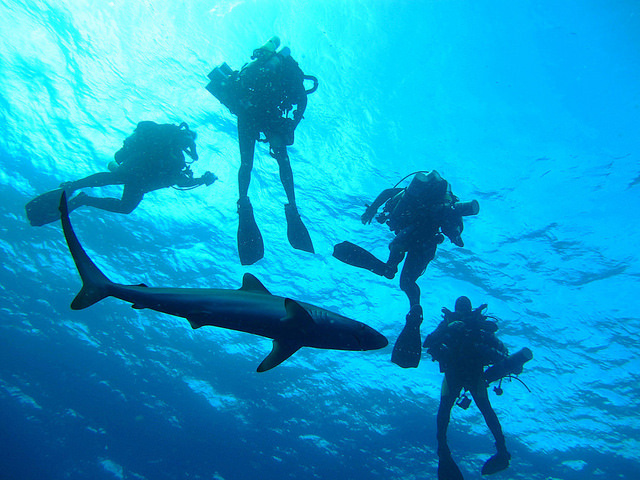 There are shark diving sports through which you can enjoy the deadly beauties of the nature from a close range. Fiji is considered to be the best place to experience such an adventure. The water kingdom has a lot to offer, and you can enjoy every bit with the help of the trained learners. The added information on the danger of being around the sharks is futile to put in words. It is known to everyone the way a shark can tear any object. However, tactful diving can help you in taking a closer look at the monsters of the sea that has a love for blood. In your diving journey, you will encounter mainly four shark types. You will meet the silvertips, white tips, grey reef and the hammerhead sharks. There are also other types that you can encounter during your journey. It is an adventure that is mixed with fear, anxiety and amazement. It is true that there are sharks that attack human. However, the chances of attacking are less. Furthermore, the high risk of attack is posed when the shark smells blood. Thus, you can be pretty sure that you will not land up in an unfavorable situation during your diving that presents threat. You will be nervous and fearful. However, if you can overcome, then this diving will surely be the most wonderful one of your life. Moreover, you will have experienced guides by your side. You will also see variation of coral reefs. The group of fishes passing though is surely an added advantage. Feeding of the sharks is s popular aspect of the place. It is enjoyed by the divers. It is an amazing feeling to feed the sharks. After all who will not love the idea of feeding these strong and beautiful creatures of water? This activity adds on to the thrill of the diving. With growing years, the sharks are slowly acclimatized with the human food. Thus, you can hope for a large set of jaw opening up to receive food from you. Looking at the fierce creatures is a sight of a lifetime. Thus, thousands of travelers visit this island for a swimming beside the dangerously beautiful inhabitants of Fiji. The entire drive is no less than wonder. During the end of the sessions, the drivers can take picture sessions with the sharks. Take pictures of the mighty creatures and that will serve as a memoir for lifetime. You can also take videos of your diving. If you are luck, then you will encounter the entire population of the species that are roaming deep down the sea.